For patients throughout the Maritimes, the Division of Infectious Diseases provides inpatient, outpatient and consultative care via the Nova Scotia Health Authority and the IWK Health Centre. We also act as a primary resource for physicians across the Maritimes, providing a 24/7 telephone consultation service. We provide inpatient care (at the QEII Health Sciences Centre) primarily to patients with severe community-acquired infections and nosocomial infections, and those who are compromised by stem cell and organ transplantation. 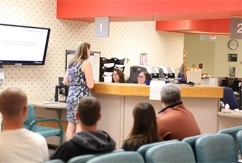 Outpatient care is delivered via ambulatory care clinics at the QEII Health Sciences Centre and at the Central Nova Scotia Correctional Facility. The general infectious disease clinic provides services to patients with a range of potential infections. Examples of patients seen include individuals with positive tuberculin skin tests or a history of TB, recurrent cellulitis, atypical mycobacterial infection, genital herpes, recurrent urinary tract infection or fever of unknown origin. The clinic presents residents with clinical exposure to a wide range of infectious disease presentations and the unique experience of seeing patients on-site at the Central Nova Scotia Correctional Facility. The Hepatitis C clinic provides care to approximately 240 HCV and HCV-HIV co-infected patients each year. Of our clinic visits, about 12 per cent are new consults. The clinic is interdisciplinary, with patients routinely seen by the physician, nurse and pharmacist. Residents are integral members of the team, initially seeing patients and then reviewing cases with attending staff. The HIV program is provided by an interdisciplinary team that includes physicians, nurses, pharmacists, nutritionists, psychologists and spiritual care workers. In addition to regularly scheduled clinic hours, HIV nurses are available to see patients five days/week. Advice to patients (and their physicians) is provided over the telephone and a clinical nurse specialist makes home visits as needed. Risk reduction advice to patients and their partners is provided and referrals to community services are also arranged. Along with direct patient care and telephone consultation, the HIV program offers provider, patient and public education and patient advocacy, giving residents the opportunity to work and learn in a multi-disciplinary, multi-faceted clinical program. The STD clinic (also known as Sexually Transmitted Infection (STI) clinic) is an evening walk-in clinic held twice weekly. The team includes primary care physicians and nurses. Almost half of the visits to the clinic are for new consults. In the STI clinic, patient confidentiality and comfort levels with care providers are of heightened importance. The clinic exposes medical students and residents to the operations of a walk-in clinic, providing care to patients requiring subspecialty care. For more information, patients can visit the STD Clinic website. In addition to providing direct patient care, our division members participate in provincial and national policy development related to infectious diseases. We provide advice and counsel to government and healthcare organizations on such topics as hospital-acquired infections, immunization programs, and infection prevention and control guidelines. Our aim is to ensure citizens’ health and wellness. The division also supports the NSHA Antimicrobial Stewardship Program to optimize antimicrobial use across the health authority.